Despite playing injured in the NFC championship game, both Richard Sherman and Earl Thomas will be available for the Seattle Seahawks in the Super Bowl, even if they might not be 100% by the time they have to play the New England Patriots. Richard Sherman underwent and MRI which revealed an elbow sprain he sustained during the second half of the game with the Packers. He remained in the game, often looking to hold his arm next to his body, finding it difficult to stretch it. Sherman did make some mistakes and got blown during the game, but in the second half, the conservative ways of Mike McCarthy made it sure that Rodgers didn’t have a chance to test his health too much. Thomas dislocated his shoulder in the first half, went to the locker rooms, and returned to action in the second half despite the injury. The Seahawks, behind the scenes, are a bit more worried about how Thomas will be in the next couple of weeks leading up to the game, but at least right now the only voice coming out of the team’s camp is saying that both players will be available for Pete Carroll in the Super Bowl, and there’s no point thinking otherwise. 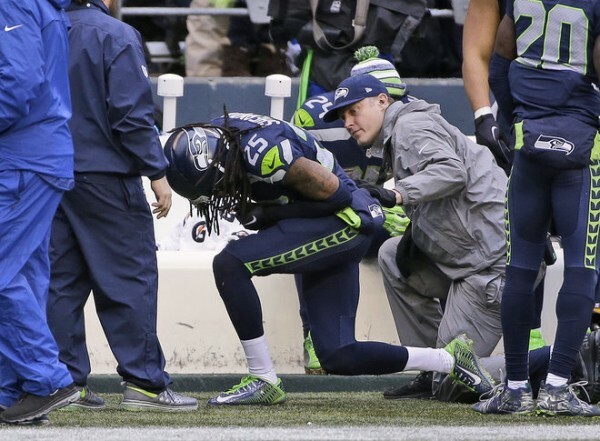 Team trainers were actually yelling at Sherman during the fourth quarter to get out of the game, but he wouldn’t listen, despite not being a lot of help to his team in his current condition. Thomas played with his shoulder placed in a harness. For the long run that might not be the healthiest of options, but it made him available for the game, and didn’t seem to be affected by the pain that he was enduring at the time. For Pete Carroll, the two of them playing with injuries was another testament to their heart and bravery, and what kind of special players he has on his team. Both those guys were in dire straits if they could play and they didn’t flinch. Not for a second. Their courage and heart couldn’t have been more evident. Their willingness to throw their body out there was so impressive. Earl had a brace on his shoulder, and Richard couldn’t straighten his arm out.